As many of you already know, IBM has released by now two preview (beta) versions of Netscape Communicator 4.61 for OS/2, the most recent having been put online on August 11, 1999. All forms of encryption are available (40-bit, 56-bit, and US/Canada 128-bit) and the feature set is comparable to the Windows, Mac, Linux, etc versions, with the "What's Related" search feature and numerous new and improves mail & news preferences. Communicator 4.61 is a free download, but since it's pre-release software, IBM requires you to register (for free) for the beta test program and to provide feedback through their web-based feedback form. The system I tested on is an AMD K6-2 400MHz with 64MB of PC-100 SDRAM and an STB Velocity 4400 (Riva TNT based) AGP video card with 16MB of SDRAM, 4.3GB and 1.6GB UDMA hard drives with 64MB default swap file located on the 2nd/slave drive while OS/2 and Communicator 4.61 ran from the 1st/master. I have fully replaced my installation of Communicator 4.04 (February 12 release) with 4.61 (August 11 release) and see no reason to go back. The new release builds upon the old, providing seamless upgrade of user profiles and settings. 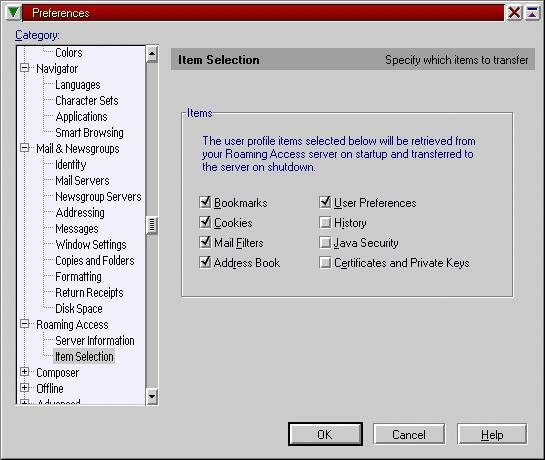 However, there are a great deal more settings to play with in the new release including Roaming Access so that you can access your user profile from anywhere on your LAN, multiple incoming mail server support (for IMAP servers only), and a new re-unified server/folder/header/message interface for both mail and news. For instance, in Navigator 3.0, the mail and newsreaders consisted of a single 3-pane interface, but in 4.0x they consisted of an awkward 2-separate-windows interface. In 4.61, we have returned to the 3-pane design, which makes browsing through multiple mail folders or newsgroups quick and easy as you do not need to switch from your reader window to the server window and then back. Dialog boxes have been compacted in size for once! The Saving Location box is now a nice little dialog that's easy to tuck away into a corner of the screen, whereas in 4.04 it was a huge monstrosity that took about twice the space it needed. There are a few bugs noted in the readme file for Communicator 4.61, including one where text can sometimes overlap boundaries (such as table cells) and we still do not have the full drag and drop support that we all grew to love in version 2.02 for OS/2. With beta2 you can now drop URL's using the Drag URL icon, onto sub-folders and not just the Desktop as in beta1. This is not working for everyone however. According to Jeffrey Kobal of IBM's Netscape Communicator for OS/2 Development Team the problem lies in NS46DRAG.DLL which institutes a WPS class to gather information on WPS objects like folders. "The most likely situation is that the class is failing to register, for one reason or another." Many of us grew accustomed to using the F5 button to refresh the current web page, but no more! In the betas of version 4.61 the keystroke has been changed to Ctrl-R, which isn't bad in itself, but confusing for those of us upgrading. The Communicator For OS/2 Bug-Tracker site (http://www.os2bbs.com/os2news/Communicator.html) lists a number of reported bugs in Communicator 4.61 for OS/2 and tries to note where the bugs originate (PM bugs, bugs carried over from the Windows version of Communicator, etc). It is definitely worth checking this list on a regular basis, as the information is updated constantly. However, some of the bugs which this site claims have been fixed (and verified) I am still experiencing, including the lack of F5 reload support, Saving Location windows not appearing in the OS/2 Window List, some tiled backgrounds not displaying properly, and so forth. As I said, I have fully replaced my GA-level Communicator 4.04 with the beta2 of 4.61. It may still have some quirks, but none so serious that version 4.04 looks good by comparison. The updated feature set and preferences alone are worth the download, as 4.04 was rather skimpy on preferences. Also, if you're one of those people who likes having a search engine built into the browser (the What's Related feature) then 4.04 just doesn't cut it. I can work around a few annoying changes from the accepted norm (using Ctrl-R instead of F5 for page reloading) so don't really see any significant deterrent to using the latest release of the best OS/2 web browser available, even if it is only a pre-release version. These days, it seems most software is considered pre-release until it's obsolete anyway. The only difference here is that IBM calls it pre-release. Since IBM encourages everyone who uses this pre-release to provide feedback, I highly recommend doing so. It's the only way to ensure that the finished product (expected for release sometime in 3Q99 I'm told) will meet all of our expectations and prove that OS/2 is anything but dead and far from being behind the pack. To reach the Communicator 4.61 for OS/2 Warp: Feedback page, just click on the Help menu, then Product Information and Support or go directly to http://service5.boulder.ibm.com/pcpd.nsf/ocomm46+feedback. You can get the latest release of Communicator 4.61 for OS/2 Warp, (as well as the previous 4.04 and 2.02 versions) from http://www.software.ibm.com/os/warp/netscape/.